Ever since I first had the Occasions Catalogue in my hot little hands, I've been so excited about the possibilities for the Geared Up Garage bundle. I just haven't had an opportunity to really play with it properly. It consists of the Geared Up Garage Cling stamp set and the Garage Gears Thinlits Dies. Soooo many gears! I don't know if you are aware but I'm a secret steampunker. 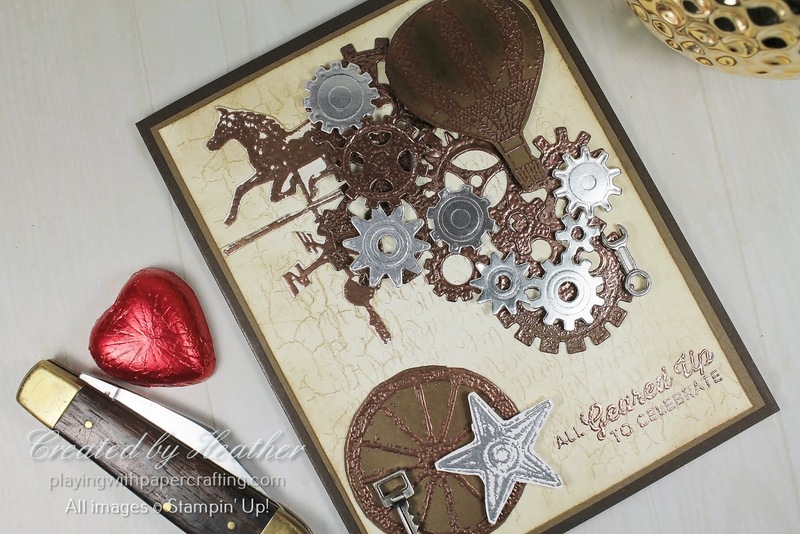 And gears really get me excited, because you can't really have anything steampunk without some gears in the picture. 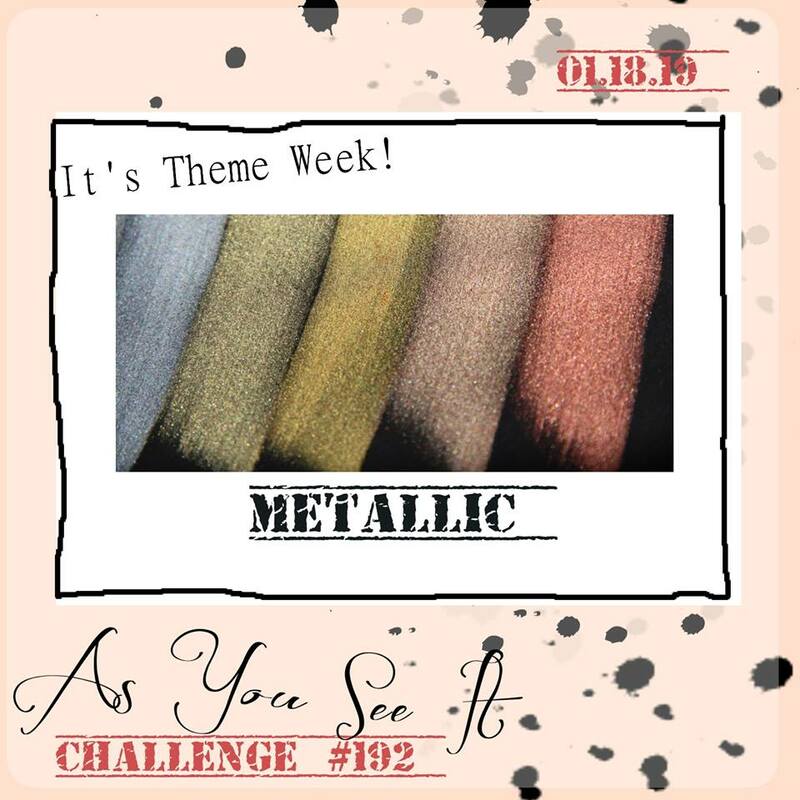 Thankfully, our newest As You See It Challenge this week has a theme and that theme is Metallics which is perfect for gears and steampunk and other masculine type images, so I went ahead with a Steampunk Extravaganza. 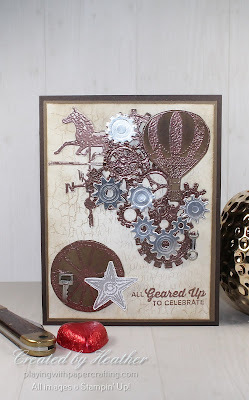 Some of the gears from the Garage Gears Thinlits Dies were die cut from Silver Foil Sheets, and the rest were die cut from Soft Suede cardstock and embossed with Copper Stampin' Emboss Powder. Some were glued flat to the card front while others were popped up on Dimensionals. I love the variety you get, though. 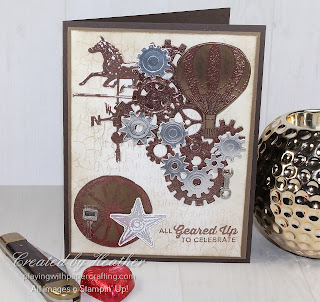 The large balloon from Lift Me Up is stamped with Versamark ink on Soft Suede cardstock as well, then embossed with Copper Stampin' Emboss Powder as well, giving it some sponging with Soft Suede ink to add some distress to it. The same treatment was given the wheel from Country Road. 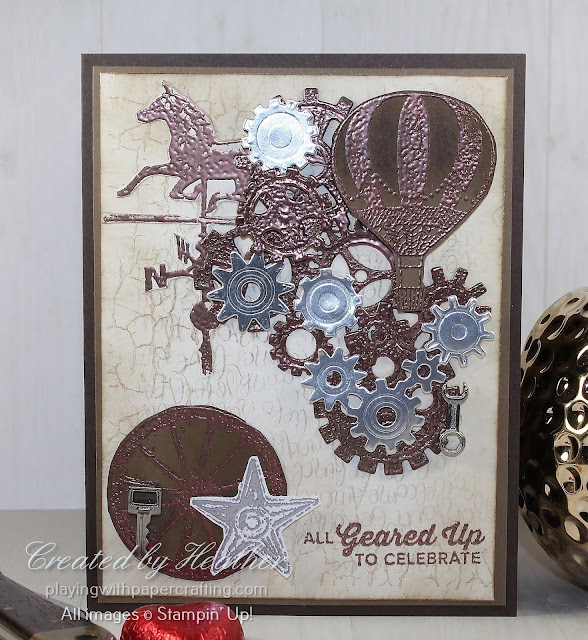 while the weather vane is embossed with copper on Whisper White and the star is embossed with Silver Stampin' Emboss Powder on Whisper White. To create the background, the Crackle Paint stamp was inked up in Crumb Cake, stamped off and the Very Vanilla panel laid over it gently. Using the fingers, it was rubbed very lightly in a few places but not everywhere, creating what I call a 'whispered' background. I repeat the process with the Handwritten stamp, but concentrate the pressure only where there was no image from the Crackle Paint where possible. The edges of the whole panel are sponged with Soft Suede before adding all the elements to it. The sentiment is from Geared Up Garage, and I stamped it in Soft Suede, but quickly added some Copper Stampin' Emboss Powder before the ink dried and heat set it. 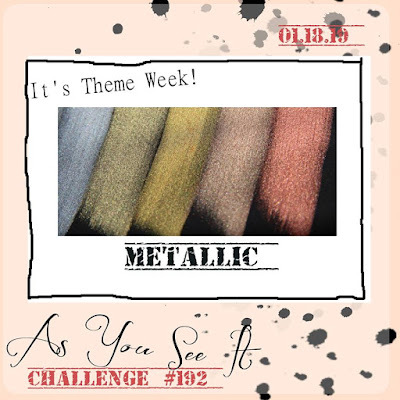 I hope you hop on over to As You See It Challenge this weekend and have some fun with metallics yourself! 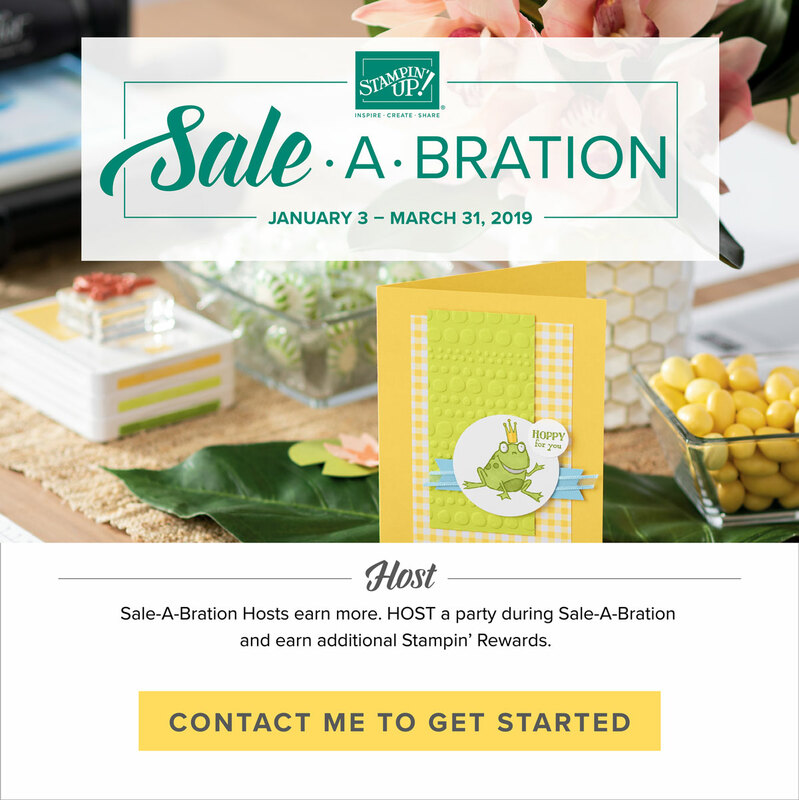 While you are wondering what to do this weekend, why don't you plan on hosting a Stampin' Up! party before the end of March! The rewards are well worth it! During Sale-A-Bration, if your party total reaches $300 or more ( and I can coach you to show you how to achieve that easily), Stampin' Up is adding an extra $30 in rewards to the already great rewards already being given. It makes quite a difference. If you can get a minimum of 6 of your friends to your place or mine, you can tell me what kind of projects you want to do and what format you want the party to take. (We can even do an online party if you want.) Contact me in the next little while to get that set up.